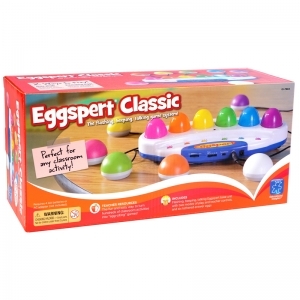 Energize class review and add pizzazz to daily activities with Wireless Eggspert, the flashing, beeping, buzzing, interactive game system that can be used anywhere in the classroom! 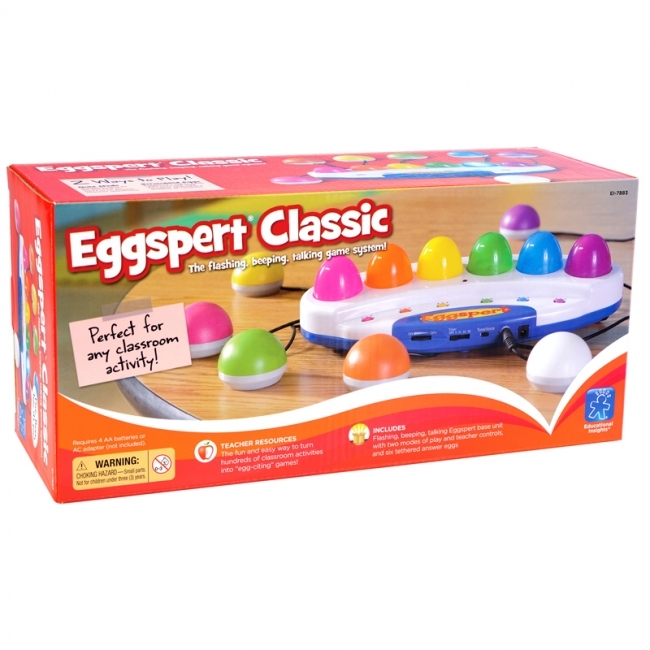 Eggspert's two fun game modes - Quiz Show and Wheel of Fortune - spice up math facts drill, spelling bees, and quiz games on any subject. 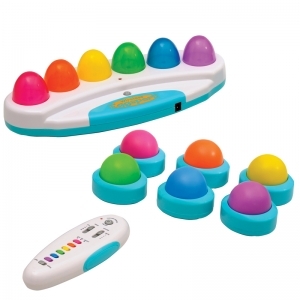 Using the wireless Teacher Remote, the instructor can set Eggspert's lights in motion, choose players, select fun sound effects, and even adjust response times - whether at her desk or anywhere in the classroom. Because student response buttons are wireless too, students can buzz in from their desks - even at the back of the class! Includes Wireless Eggspert, 6 wireless student buttons, wireless teacher remote and guide. 2.4 gHz for the fastest, most reliable transmissions. 2 ways to play—Quiz Show and Scrambled Eggs. Wireless Eggspert 2.4gHz requires 4 AA batteries (not included). Student wireless buttons require 2 AAA batteries each (not included). Wireless teacher controller requires 3 AAA batteries (not included). 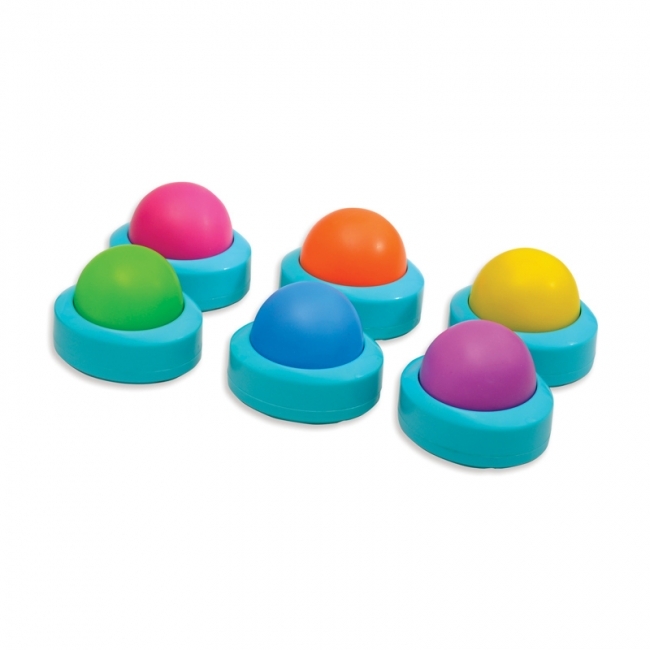 This set allows six more students to join in and encourages team play in Eggspert's "Quiz Show" mode. Instead of relying on a team captain, two players per team can individually "buzz in" to answer for their team. Perfect for scholastic competitions and review. Includes 6 extra pods, 1 of each color. 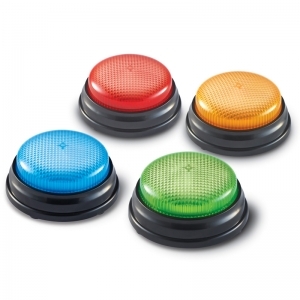 Student wireless buttons require 2 AAA batteries each (not included). 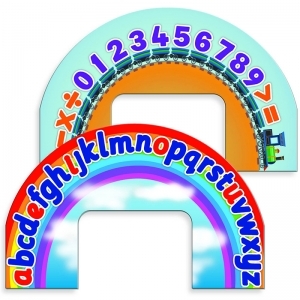 Children can layout their Touchtronic® Letters and Numbers around the arc of the new Touchtronic® Placeholder, teaching the correct sequence for learning the alphabet and counting. Age 3+. Come up with your own fun buzzer sounds! 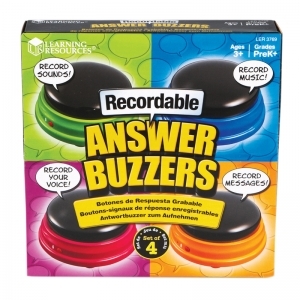 Record silly messages, words, sounds or music—the possibilities are endless! Record up to 7 seconds per buzzer. Just tap, record, tap, and listen! 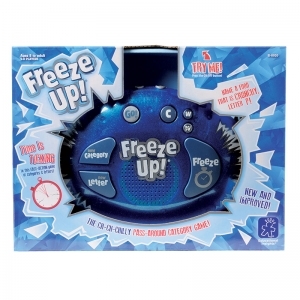 Great for the whole class or for engagement in small groups. Includes 4 recordable buzzers in different colors and Activity Guide. 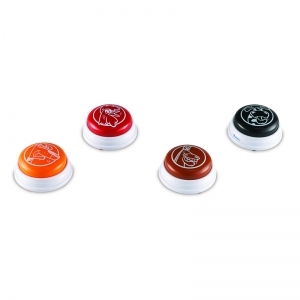 Each buzzer measures 3½" in diameter and requires 2 AAA batteries, not included. 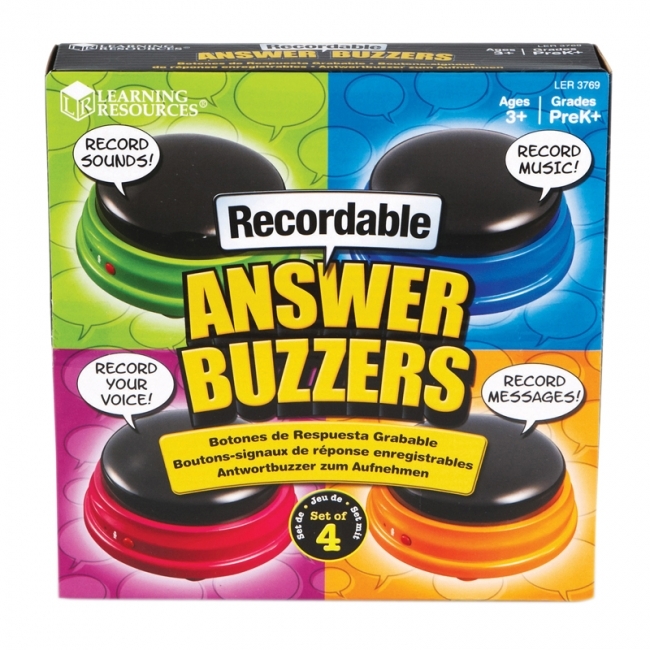 Boost student response during any class activity or game! Sounds mimic real-world objects—a siren, a game-show buzzer, a laser and a "charge!" sound. Cook up amazing recipes with this engaging, resourceful Google™ cookbook! Great for both the beginning and seasoned Google-using teacher, this resource is the perfect tool to help guide teachers using, or preparing to use, Google Apps for Education™. 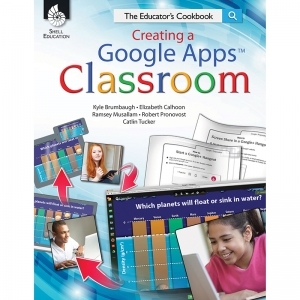 Featuring Appetizer Recipes (warm-ups), Entrée Recipes (fresh take on an old standby lesson), Side Dish Recipes (used at any point in in lesson or unit), and Dessert Recipes (creative lessons to enjoy with your classroom), this resource will help you feel comfortable using Google Apps™ in no time. Helpful icons, easy-to-follow instructions, screen shots, and websites are also provided throughout for ease of use.